After you have honorably served in the military, you are classified as a Veteran. Being a veteran has its perks whether you are retired military or not. Easy access to home loans, education benefits, veteran group insurance programs, and many other organizations allow the returning veteran better assimilate into civilian society. The Veterans of Foreign Wars (VFW) and the American Legion organizations are by far the two “best known” veterans associations that have done a large amount of good not only for veterans by society as a whole for over 100 years. The American Legion (sometimes referred to as “The Legion”) began after World War I as a group of twenty officers who served in the American Expeditionary Forces (AEF) in France. The AEF Headquarters had asked these officers to suggest ideas on how to improve troop morale. One officer, Lieutenant Colonel Theodore Roosevelt, Jr. (eldest son of the 26th President), made the proposal of an organization of veterans. In February 1919, this group formed a temporary committee and selected several hundred officers who had the confidence and respect of the whole army. The following month, about 1000 officers and enlisted men attended the first organizational meeting, known as the Paris Caucus. At this meeting, the group adopted a temporary constitution and the name "The American Legion." The American Legion was chartered by Congress in 1919 as a patriotic, mutual-help war-time veteran’s organization and the first American Legion post in the United States was General John Joseph Pershing Post Number 1 in Washington, D.C., organized on March 7, 1919. Since then, the American Legion has evolved from a group of war-weary veterans of World War I into one of the most influential nonprofit groups in the United States - the American Legion is a community-service organization which now numbers over 2.4 million in 14,000 posts worldwide. The posts are organized into 55 departments: one each for the 50 states, along with the District of Columbia, Puerto Rico, France, Mexico, and the Philippines. 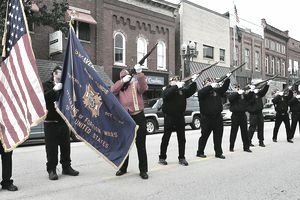 The VFW's forefathers were two smaller veterans groups that started in 1899 when to two veterans organizations, the American Veterans of Foreign Service and the National Society of the Army of the Philippines merged to form the Veterans of Foreign Wars in 1914. These first veterans groups were formed as local organizations after the Spanish American Wars and Philippine Insurrection to secure veteran's rights and benefits for their service, as many had arrived home wounded or sick. In those days, there was no Veterans Administration care or pensions for medically retired. These organizations enabled veterans to care for and help each other with the transition from the battlefield to normal life. The first VFW chapters were formed in Colorado, Ohio, and Pennsylvania. Of the three posts that claim to be the first, the VFW national organization recognizes the Denver Post as being first; it is now officially "VFW Post 1. By 1915, membership grew to 5,000; by 1936, when it became a government-chartered non-profit organization, membership was almost 200,000. Today, membership stands at around 1.4 million (though, National membership in VFWs has fallen from 1.8 million in 2004). To be a member of the VFW, the individual must be a U.S. citizen or national with an honorable discharge from the U.S. military, or currently serving in the United States Army, Marine Corps, Navy, Air Force, or Coast Guard. Membership also requires military service overseas during an operation or conflict and decoration with an Armed Forces Expeditionary Medal, a campaign medal (or ribbon). This requirement is the major difference between the two organizations. Both the American Legion and the VFW have extended beyond the realm of simply being veterans helping fellow veterans - from their beginnings of providing financial, social, and emotional support to members of the United States Armed Forces, veterans, and their dependents, and being leaders in community involvement in such areas as mentoring youth groups, helping in community food kitchens, and volunteering in blood drives, and other civic voluntarism (to give a few examples). Wearing a Uniform When Not in the Military: Is it Legal?